Almost every parent, living with their newborns in a region that gets very cold in winter, or has a dry climate, must have been suggested to get a humidifier by many people. If you too are one of them, you might be wondering what a humidifier is, and why do you need it for your baby. Continue reading, and you shall discover your answers. 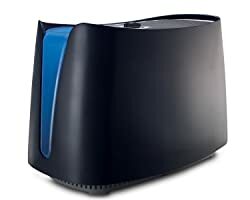 ​A humidifier is a machine that increases moisture or humidity in a room or in an entire building. 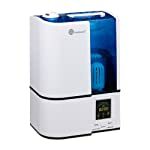 Point-of-use humidifiers are generally used to humidify one room, whereas furnace or whole-house humidifiers that connects to the HVAC system of a home is used to humidify the whole house. Parents living with newborns in dry or cold regions must purchase a humidifier for their little one’s room, as it can prove to be a great alternative to cold and cough medicines, as the FDA is against the idea of giving over the counter medicines to newborns. Which Type of Humidifier is Best for Your Baby? One of the most important and obvious benefits of having a humidifier in your newborn’s room is that it protects against dry air. The device applies in particular in winter months, when the indoor air gets too dry, as your heating system steals the natural moisture present in it. You may have observed that harsh air leads to various problems like dry sinuses, stuffy nose, and sore throats. Since babies get congested much faster, they fall prey to infections and sicknesses common in the cold months easily. As a humidifier adds the needed moisture to the room’s air and creates the right breathing conditions, it loosens build-up of mucus and helps your little angel sleep comfortably. By adding moisture to the air, a humidifier relieves your child of dry, irri﻿﻿﻿﻿tated s﻿﻿﻿﻿kin. Baby’s skin is very sensitive to dry climates, and this can result in chapped, tender lips, and red patches. The dry air can also aggravate skin conditions like eczema. If you use a humidifier, it will add moisture back and thus helps your baby’s skin retain its natural moisture, remain clear and soft. The white noise a humidifier produces is its yet another benefit. The comforting, rhythmic hum created by the humidifier is quite like the whooshing sound your baby would hear when in the womb. Together with helping keep out outside noises like television or barking of dogs, it will ensure that your child enjoys a very protected feel and a comfortable sleep. Humidifiers are categorized as cool moisture and warm mist or warm moisture. Even though they work in different ways, they produce the same result, that is, they add moisture to the air. Let us now get to learn how each of them works. These humidifiers have a heating element that heats up the water present in the humidifier, creating a warm steam to rise in to the room. Certain warm mist humidifiers come with an optional mineral absorption pad that stays within the heating element, and collects the mineral deposits that are left behind by the heated water. Apart from this optional and inexpensive replacement pad, you do not need to replace any other filters as far as a warm mist humidifier is concerned. This type of humidifier can further be divided into two categories - ultrasonic humidifiers and evaporative humidifier. Evaporative Humidifier: It uses a fan to blow dry air into the room through a wick filter, which is evaporative, and is generally made of special absorbent paper. This wick filter is present within the base of the evaporative humidifier, and absorbs the water within. As air is blown by the fan, through this wick filter, the water present inside evaporates and gets distributed in the room as humidified air. Even though this method requires no heating element, thus using less electricity, the wick filters do need to be replaced regularly. Ultrasonic Humidifier: In this case, instead of the fan there is a little metal diaphragm, which vibrates at ultrasonic frequency, breaking the water into small drops, which then becomes a vapor mist. Ultrasonic humidifiers are amongst the quietist available, and use little electricity. Now, the question is which is the best humidifier for baby. Well, even though it is mostly about personal preference, the below given list may help you decide. Warm mist humidifier makes the room feel a little warmer because of the warm steam it releases. Cold humidifiers produce an opposite effect, and make the air feel cooler when the fan blows air over the evaporative wick filter. So, if you live in an area with warm climate, a cold mist humidifier will be more ideal, and if you live in a colder climate, then a warm mist humidifier will be a better choice. Warm mist humidifier creates less noise, and thus is ideal to be used at bedtime. Ultrasonic humidifiers are quieter, and you will hardly hear any sound. Cold mist humidifier, on the other hand, has fans that do make noise. Its noise level depends on the fan speed you have set the humidifier on. Some people opt for the best cool mist humidifier as the white background sound it creates helps them sleep better. Lastly, though this is not always true, ultrasonic humidifiers and mist humidifiers are best for smaller rooms, as they usually do not produce moisture enough to cover larger areas. This is quite ideal for little nurseries. However, if you have a big nursery for your baby, then you should look for cool mist evaporative humidifier with large output. No matter which humidifier you opt for, make sure you follow the manufacturer’s instructions while using it, and also clean it as advised. Always remember, a well-maintained humidifier offers the best results. Most parents will tell you that a humidifier is very helpful when babies have a cold. But, what you need to know is that together with easing symptoms of congestion or cold, and soothing the throat of your baby, a humidifier can also help him/her sleep better. So, if you want your little angel to be healthy and enjoy a peaceful sleep at night, you certainly should consider investing in a humidifier. But, with so many options available, how do you select the best humidifier for baby. To make things easier for you, given below are some points that you must consider, and some that need to be avoided. If you follow this list carefully, you surely will end up buying the best. Low Noise: You certainly would not want to invest in a machine that will wake your angel up while operating. So, you should make sure that the humidifier you buy is as quiet or silent as is possible, and yet offers you excellent service, so that your baby gets quality sleep, and stays healthy. Antibacterial Features: Apart from creating a relatively humid environment that helps your child feel comfortable, would it not be great if your humidifier also successfully fights any bacteria present in the water and the room? To make this possible, you may consider buying a humidifier that has Ultra Violet lights, cartridge, or filters. Automatic Shut-off: It will also be great if you choose a humidifier for your baby’s room with automatic shut-off feature. With already so much to do, chances are you might forget to switch off the humidifier, and then will need to go back to your baby’s room once he/she has slept. To avoid all this trouble, and also to prevent the risk of waking your child whenever you enter his/her room, you can get a humidifier with automatic shut-off features. Cleaning: You will have to clean your humidifier and its tank regularly, so purchase something that makes the cleaning job easier. Get a unit that comes with a removable water tank for easy cleaning and refilling. This will save you both effort and time. Not Consulting the Doctor: No matter how benefiting a device might be, before buying anything that can affect your child’s health in any way, you should first consult his/her pediatrician. Since pediatricians know your child’s needs, and already must have recommended humidifiers to their previous patients, they will be able to guide you with the best. Giving Price Maximum Importance: Price should never be the judging factor, particularly when you get something for your baby. A low priced machine may come with fewer accessories or may offer low performance. On the other hand, high priced gadgets may come with unnecessary accessories, which you might never even use. As a parent, you naturally would want to get the best for your baby, and for this, you need to be a wise shopper. Carefully go through few models, look for the features you need, go through their reviews, and make a list of a few you like. Amongst these, you can choose the one that quotes the lowest price. Not Doing Research: You should never buy something you are not at all aware of, do not know how it works and have no idea about its level of performance. You just cannot get something for your baby solely depending on word of mouth. Remember, what works for one baby might not work for your angel. So, even though learning about different people’s experience can help you, it should not be the determining factor. You need to do proper research, learn about the features, and the advantages and disadvantages of a particular humidifier, and go through some reviews and testimonials. If everything about a particular humidifier seems fine, you can get that for your baby, and help him/her stay away from common cold illnesses, and allow him/her enjoy a peaceful, happy sleep. 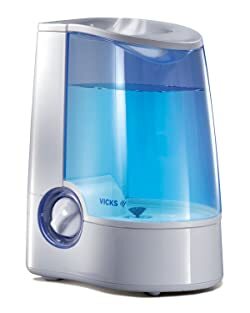 Vicks Warm Mist Humidifier is one of the amazing machines that you should have at home if you want to breathe some fresh and humidified air. It will provide you with vapors that are 95% free of bacteria, and it will not need any filters. The one-gallon tank is enough to run for 24 hours without having to refill, and it has two humidity levels. Bacteria Free Vapors: It provides vapors that are 95% bacterial free and hence ensuring that you do not only breathe humidified air but also fresh and clean air. And the best thing is that it does not require any filters. Auto Shut-Off: The machine will shut down automatically when the water level is low, and this is a crucial feature as it will help prevent it from getting damaged. Since this an electrical machine, there is also the possibility of it catching fire and so the auto shut-off is vital. Tank Capacity: Vicks Warm Mist has a one-gallon tank that can run for up to 24 hours continuously on a single filling. The tank capacity is one of the things that make it unique as you will never have to interrupt your sleep to refill it. The TT-AH002 is an Ultrasonic humidifier that operates silently but still keeps your hair humidified and gets rid of bacteria and bad odors. It has a control knob that will help you adjust the level of mist and a 360-degree rotatable nozzle that dispenses the mist in two directions simultaneously. The humidifier has a large 3.5 liters tank that gives it the capability to run for 10 hours nonstop. Large Water Tank: It has a 3.5 liters water tank that will help it run for up to ten hours without having to refill it. The large tank makes it perfect for use at home and in the office. Classic Control Knob: The knob will help you adjust the level of mist in the room fast and effortlessly. And the best thing is that the machine will automatically shut off when the water level is low and give you a warning using a red LED indicator. 360 Degree Nozzle: Its nozzle can rotate up to 360 degrees, and this means that you can be able to direct the mist to where you want. The nozzle also discharges mist in two different directions simultaneously. Honeywell is one of the leading manufacturers of humidifiers and so even without using the H-350 it is right to expect it to be of high quality. 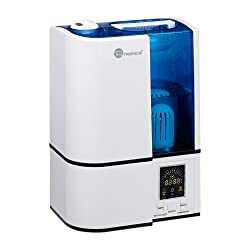 And it does not disappoint as it not only gives you humidified air but also uses UV Technology to kill bacteria, fungus, viruses and many other microbes. It has a larger tank that makes it possible for it to run for up to 24 hours without refilling and the QuietCare technology makes it up to 25% quieter than others. · Ultraviolet Technology: The machine dispenses germ-free mist that will kill viruses, bacteria, fungus and mold using an impressive UV technology. QuietCare Technology: Honeywell’s QuietCare Technology will enable the machine to run at 25% quieter than other home humidifier machines on the market. And this is regardless of the speed of operation. Protect Antimicrobial Filter: This specially treated filter will give you an antimicrobial product that will help you maintain moisture balance in small and medium size rooms. And so this filter makes it a perfect humidifier for your home, office and any other small business space where you want to breathe fresh humidified air. Its large water capacity gives it the capability to run for the entire night or at least 15 hours without refilling. With this machine, you can also control the humidity and mist levels for maximum comfort. The LED and built-in timer also make it easy to operate and control. Control: This humidifier gives you more control than others because you can be able to control mist amount and also set the level of humidity. 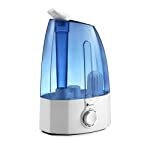 Cool Mist Humidifier: It is a cool mist humidifier with a microporous filter that gets rid of microorganisms, magnesium and calcium from the water. However, you should not add chemical perfume or essential oils in the water if you want it to function well. Water Capacity: This machine has a water capacity of slightly over a gallon, and it can run for up to 15 hours in a single tank or the whole night. And this means that you will not have to wake up late at night to refill it. 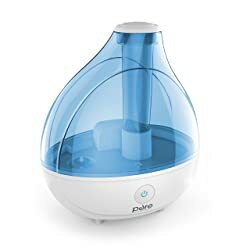 Ultrasonic Cool Mist Humidifier from Pure Enrichment is one of those things that you must have in your baby's room if you want her/him to be as comfortable as possible. It moisturizes the dry hair in the room in a couple of minutes and hence making the room very comfortable and helping to prevent things such as cold, dry skin, and hoarse throat. The humidifier is also very easy to use and can run continuously for more than 16 hours. Auto Shut-off: The machine will shut off automatically when the tank is dry and even when you remove it, and this helps to avoid damages to your humidifier. Ultrasonic Cool Mist: This technology will moisturize the hair for more than 16 hours safely. And this will make sure that you get to breathe easy, feel comfortable in your house and also have a peaceful sleep.